Academic Mint E-Juice 30 ML (3 x 10 ML) by Professor Vape is, essentially, Ice Mint; why not just call it Ice Mint? I assume because they feel the name suits the range better, but, the name aside, the juice itself is great to vape. Wonderful flavour which is very cool and the taste of mint is inescapable. 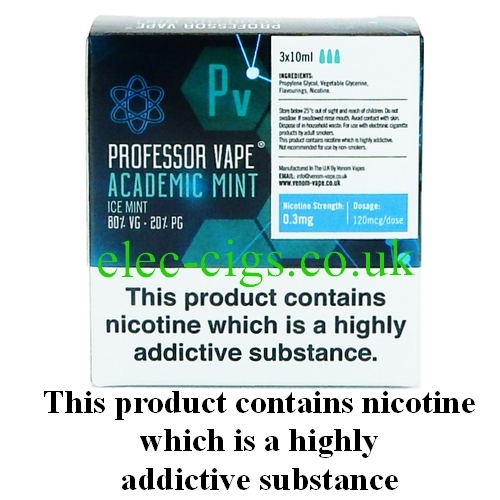 Academic Mint E-Juice 30 ML (3 x 10 ML) by Professor Vape is an 80-20 (VG/PG) mix which, as well as tasting great, produces a ridiculous amount of cloud: so if it is cloud chasing you want it is here in abundance. You have a choice of two nicotine strengths which are 3 mg (0.3%) or 6 mg (0.6%). It is sold in 3 x 10 ml plastic bottles. Academic Mint E-Juice 30 ML (3 x 10 ML) by Professor Vape contains nicotine which is highly addictive and should not be used by non-smokers. You must be at least 18 years of age to buy this e-juice and by doing so you confirm that you are of a legal age to do so.